That language prompted Clark County Council members Eileen Quiring and Jeanne Stewart to vote against the resolution. Vancouver mayor Anne McEnerny-Ogle, who is vice-chair of the RTC Board, brought the resolution forward, although Executive Director Matt Ransom crafted most of the language. In public comments before the vote on the resolution, Camas resident John Ley pointed to recent studies that show the biggest traffic problem in the metro area, outside of Highway 26 west of the Vista Ridge Tunnel, is I-5 through the Rose Quarter in downtown Portland. As for high capacity transit, Ley and Quiring both pointed to recent data from C-TRAN that showed about 1,500 people currently ride their route into Portland each day, raising questions about how popular a dedicated mass transit option would be. “Just because Oregon demands a new Light Rail project in search of a bridge, doesn’t mean you should spend our transportation dollars on something that doesn’t fix the problem,” said Ley. Clark County Council is expected to soon pass another resolution related to Federal funding of the Interstate Bridge project, pushing the US Department of Transportation to approve enough funding to avoid the need for tolls on either the new bridge, or both crossings into Portland. A dedicated guideway, in transportation terms, simply means a lane exclusively used for mass transit. Clark County Chair Marc Boldt wanted to know if including that term in the RTC resolution meant they were asking for a larger project than just replacing the 100-year old bridge. C-TRAN Executive Director Shawn Donaghy said the new bridge would likely compose at least 85 percent of the guideway. The RTC resolution does not mention adding any added capacity for regular traffic, which both Quiring and Stewart mentioned in saying they wouldn’t support it. WSDOT Regional Administrator Kris Strickler abstained because he is leaving at the end of this week to take a job with Oregon’s Department of Transportation. Metro Council representative Shirley Craddick also abstained. The RTC vote is the latest in a series of such resolutions passed by city governments and the county council. La Center’s city council decided, instead, to send a letter to the governor’s office, rather than passing an official resolution. McEnerny-Ogle said her office already has a meeting set up with Washington Governor Jay Inslee in November to address the bridge, and push for funding to open a Department of Transportation office in Vancouver to work on the project. 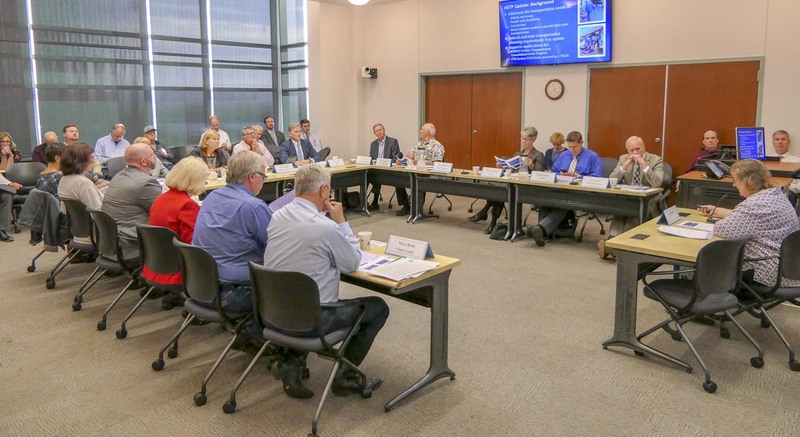 17th District Representative Paul Harris said the Southwest Washington legislative delegation met last week to discuss priorities, including the Interstate bridge project. He said a meeting with Governor Inslee is set to request $10 million for the new WSDOT office, along with Oregon House Speaker Tina Kotek and, possibly, the rest of the Oregon legislature. Meetings with Oregon’s governor will have to wait until after the results of November’s election. Whatever happened to a third crossing? One issue brought up in public comments was the possibility of a third Columbia River crossing, either east of I-205 or west of I-5. Sharon Nasset with the Economic Transportation Alliance said even many elected officials don’t seem to remember that the Columbia River Crossing project wasn’t just about replacing the I-5 Bridge, but an environmental impact study looking at multiple options. The bridge replacement was, ultimately, adopted as the Locally Preferred Alternative. But Ed Barnes, a Vancouver resident, said the idea of a third crossing isn’t an efficient use of the limited transportation funding available. Just before calling for the vote, Ridgefield City Councilor Ron Onslow, chair of the RTC Board, said he’d love to have a conversation about added traffic capacity, funding, and even a third crossing, but that this steps needs to be taken before we can get there.